Habit: Annual, often glandular, sometimes brown-staining. Leaf: opposite; proximal petioled. Inflorescence: bracted, often interrupted; flowers 1--many in leaf axils. Flower: calyx lobes 5, generally glabrous on inner surface; corolla +- pea-like, uniformly pale, or generally with pale regions, especially throat and base of upper lip (+- uniformly dark in Collinsia greenei), generally glabrous outside, tube short, throat +- angled to tube, +- pouched on upper side, lips generally +- = throat, upper lobes 2, +- reflexed, lower lobes 3, lateral spreading, central lobe keeled, enclosing stamens and style; stamens 4, attached unequally near throat base, spur at base of upper filaments > 1 mm, vestigial, or 0; staminode gland-like; style > 2 mm, stigma minutely 2-lobed. Fruit: septicidal and loculicidal (valves 2-lobed). Seed: generally few, +- oblong, generally plump; inner surface +- concave. Species In Genus: +- 20 species: North America, especially California. Etymology: (Zaccheus Collins, Philadelphia botanist, 1764--1831) Note: Late-season flowers generally atypically small. Habit: Plant 10--50 cm. Leaf: lance-deltate, toothed, often deeply lobed in seedlings. Inflorescence: interrupted, glabrous to hairy, +- glandular; whorls dense; pedicel < calyx. Flower: calyx lobe tips generally acute, glabrous to shaggy-hairy; corolla throat hairy inside, strongly angled to tube, as wide as long, pouch prominent, +- square, upper lip white to lavender or tipped dark violet, wine-spotted and generally +- red lined near base, lower lip +- white to rose-purple, lowest lobe generally with darker red tip; upper filaments hairy, basal spur 1--2 mm, curved into pouch. Seed: many, ovate, +- flat. Chromosomes: n=7. Leaf: glabrous abaxially (at most ciliate on midvein) Flower: corolla (13)15--20 mm, upper lip +- = lower lip. 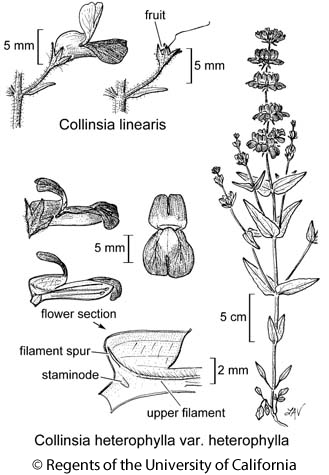 Citation for this treatment: Michael S. Park & Elizabeth Chase Neese 2012, Collinsia heterophylla var. heterophylla, in Jepson Flora Project (eds.) Jepson eFlora, http://ucjeps.berkeley.edu/eflora/eflora_display.php?tid=56716, accessed on April 21, 2019. NCoRO, NCoRI, CaRF, SNF, Teh, ScV (Sutter Buttes), CW, SCo, ChI, WTR, PR (exc SnJt); Markers link to CCH specimen records. Yellow markers indicate records that may provide evidence for eFlora range revision or may have georeferencing or identification issues. Purple markers indicate specimens collected from a garden, greenhouse, or other non-wild location.